SOJOURNER'S TRUTH: "I will shake every place I go to"
The Historic Northampton Museum Store is pleased to offer Enchanted Circle Theater's Sojourner's Truth: "I will shake every place I go to" written by Priscilla Kane Hellweg and Rachel Kuhn. the full theatrical script spiral bound in color. 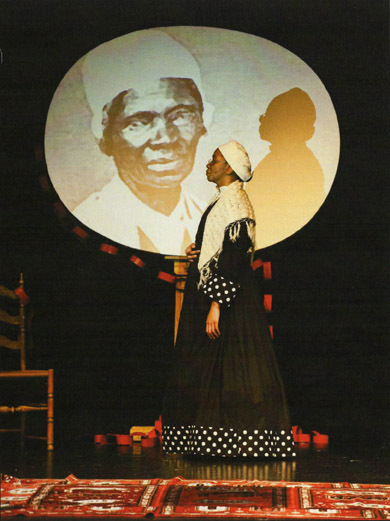 The play was commissioned by the Sojourner Truth Memorial Committee. On April 1, 2010 Sojourner's Truth premiered to standing-room-only crowd at the Academy of Music in Northampton. The production traveled to middle and high schools throughout the region and received accolades. In 2012, Enchanted Circle Theater recorded Sojourner's Truth in its entirety as an audio CD and then created this companion book with the theatrical script to reach additional audiences.